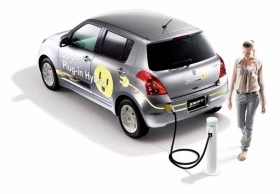 The Suzuki Swift plug-in hybrid can cover about 20km in electric mode. MUNICH -- Suzuki will show the plug-in hybrid version of its Swift for the first time in Europe at the Geneva auto show in March. The subcompact combines an electric motor with a 54 kW lithium-ion battery. They work together with a three-cylinder range-extending gasoline engine that recharges the battery when it is low on power. This powertrain solution is much like that found in the forthcoming Opel/Vauxhall Ampera plug-in hybrid and on the Ampera's sister model, the Chevrolet Volt. The Swift hybrid can cover about 20km in electric mode. The Japanese automaker also will display the Kizashi, which in English translates into “something great is coming.” Suzuki certainly hopes the car lives up to its name as it is the automaker's first model in the mid-sized segment, which is dominated in Europe by the Volkswagen Passat, Opel/Vauxhall Insignia and Ford Mondeo. The Kizashi is Suzuki's first mid-sized model. The Kizashi debuts in Europe this year with a 178-hp 2.4-liter four-cylinder engine mated with a continuously variable transmission. The sedan produces 191 grams per kilometer of CO2 and burns 8.3 liters of fuel per 100km. 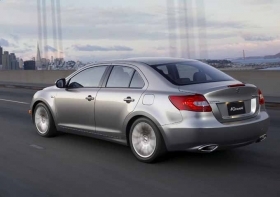 The Kizashi has standard all-wheel drive and paddle shifts on the sides of steering wheel. Rounding out Suzuki's Geneva debuts will be a new version of the three- and five-door Grand Vitara. Gone from the updated SUV is the spare-tire holder that is on the back door of the current models. Suzuki says the change gives the Grand Vitara a more stylish look while allowing for better maneuverability when driving in the city.